So I’m assuming that if you’re thumbing through an NCLEX book that you’re probably nearing the end of nursing school. I want to start by saing that you should be so proud of yourself! You’ve worked so hard to get here, & I promise you, it’s so worth it. I’ve been a nurse for 12 years & can’t imagine doing anything else. I want to let you know that the first year or two out of school is the hardest. But don’t give up & remember why you decided to become a nurse in the first place. 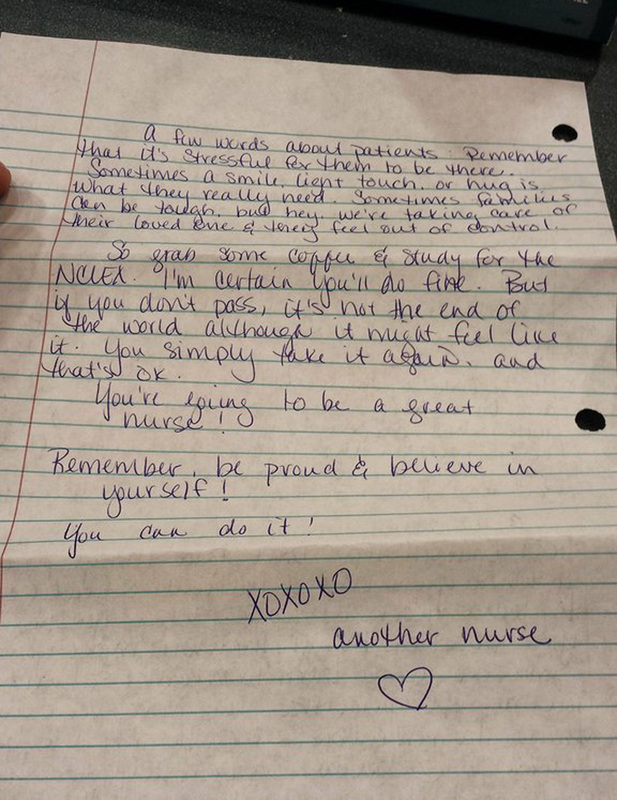 There are times when “nurses eat their young” and when that happens to you, I want you to refer back to this letter. When you start your new job, find that special nurse to take you under their wing to show you the ropes. A few other things: be patient, & don’t beat yourself up. Don’t take things personally & when you’ve had a difficult situation, try to leave work at work. When you begin your job, two things that will make your day smoother are (1) learn to organize & build a routine, & (2) prioritize. Two more very important things to remember are (1) be proud to be a nurse, & (2) believe in yourself. Also trust your instincts - they’re usually right! Also be kind to the nurses aides & housekeepers - you need them. A few words about patients. Remember that it’s stressful for them to be there. Sometimes a smile, light touch, or hug is what they really need. Sometimes families can be tough, but hey, we’re taking care of their loved one & they feel out of control. So grab some coffee & study for the NCLEX. I’m certain you’ll do fine. But if you don’t pass, it’s not the end of the world although it might feel like it. You simply take it again, and that’s OK.
You’re going to be a great nurse! Remember, be proud & believe in yourself! This is awesome !! 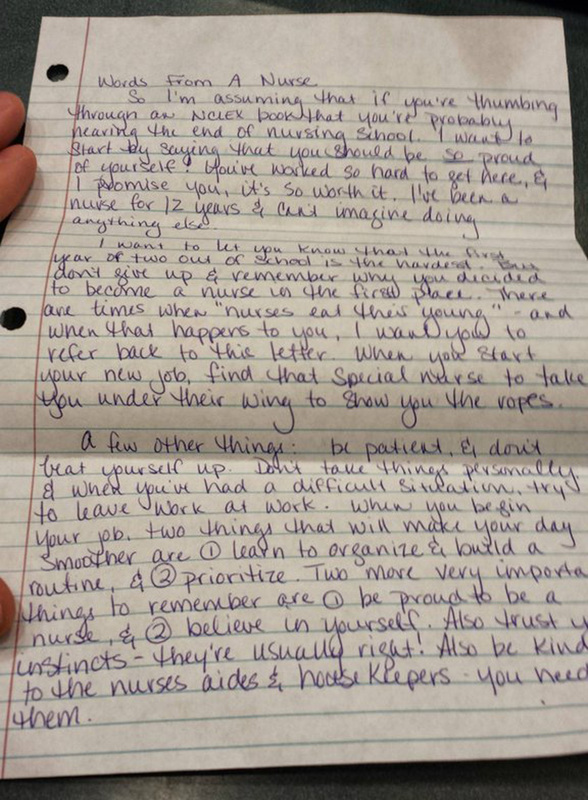 Every new nurse needs a mentor like this. Thanks for posting, Paul. Letter makes a good point. There are plenty of nice, reasonable people out there. You just need to find them and make them the focus of your world. I am just starting nursing school, and I can assure you, nobody will be eating me. Yes, truly, every new nurse needs this kind of advice!